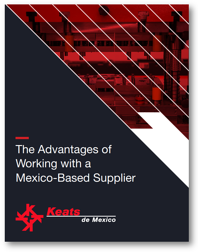 The Advantages of Working with a Mexico-Based Supplier eBook | Keats Manufacturing Co.
Over the last 50 years, the Mexican economy has grown tremendously with an export-oriented industrial focus. With an economy dramatically outperforming its neighbors, Mexico has been leading Latin America’s manufacturing initiatives in recent years. For American companies, nearshoring old ventures previously produced in Asia as well as developing new manufacturing projects in Mexico comes with a huge range of benefits and opportunities — for employees and customers alike. An overview of the Mexican manufacturing sector. High-end industries served by Mexican manufacturing. The benefits of Mexico's proximity to domestic American manufacturing. To download your copy, simply fill out the short form to the right. To download your copy, simply fill out the short form to the left.